I have a confession to make. I am tired of chickens. I’m tired of hauling 50lb sacks of feed, filling 5 gallon waterers, chasing chickens back into a safe space and all the other “fun” things that come with being a Chicken Wrangler. I was thinking Sunday about getting rid of them all. Today I looked out the kitchen window and they were chasing each other around the chicken yard. 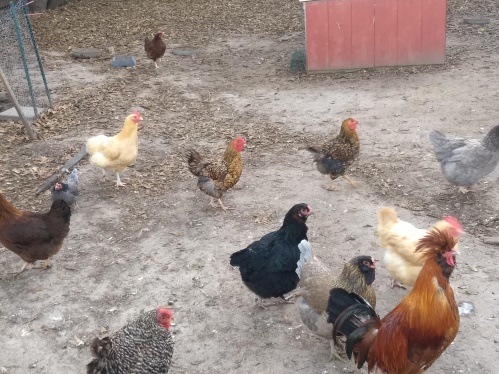 I walked out to check for eggs and they all ran up to greet me in the goofy way chickens run, with their wings flapping. It made me smile. So I suppose I’ll keep them around for a little while longer.